Ambient/traditional flute music from Japanese shakuhachi Master, Teruhisa Fukuda. The shakuhachi is an end-blown bamboo flute with one dorsal and four frontal holes and a beveled notch as mouthpiece. There are two elements in the name of the instrument: shaku refers to an ancient measurement which is the equivalent of 30,3 cm; hachi means eight. Originally, shakuhachi thus refers to a flute that measures 1,8 shaku, that is, 54,5 cm. 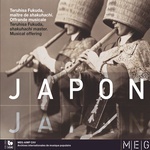 For this release, Master Fukuda chose a series of seven pieces from a repertoire dating back to the seventeenth century. These were originally performed by monks belonging to the Fuke sect of Zen Buddhism, who viewed their instrument as means for meditation. The seven pieces are destined to be played solo, in the spirit of Zen. Teruhisa Fukuda (b. 1949) is an eminent artist who has explored a vast range of musical techniques from, both, traditional and contemporary music.